Tess’s sense of a certain ludicrousness in her errand was now so strong that, notwithstanding her awe of him and her general discomfort at being here, her rosy lips curved towards a smile, much to the attraction of the swarthy Alexander. “I suppose I have,” faltered Tess, looking uncomfortable again. She gave him brief particulars and, responding to further inquiries, told him that she was intending to go back by the same carrier who had brought her. Tess wished to abridge her visit as much as possible; but the young man was pressing, and she consented to accompany him. He conducted her about the lawns, and flower-beds, and conservatories; and thence to the fruit-garden and green-houses, where he asked her if she liked strawberries. “They are already here.” D’Urberville began gathering specimens of the fruit for her, handing them back to her as he stooped; and, presently, selecting a specially fine product of the “British Queen” variety, he stood up and held it by the stem to her mouth. “Nonsense!” he insisted, and in a slight distress she parted her lips and took it in. Stoke-d’Urberville took her back to the lawn and into the tent, where he left her, soon reappearing with a basket of light luncheon, which he put before her himself. It was evidently the gentleman’s wish not to be disturbed in this pleasant tete-a-tete by the servantry. “Do you mind my smoking?” he asked. He watched her pretty and unconscious munching through the skeins of smoke that pervaded the tent, and Tess Durbeyfield did not divine, as she innocently looked down at the roses in her bosom, that there behind the blue narcotic haze was potentially the “tragic mischief” of her drama- one who stood fair to be the blood-red ray in the spectrum of her young life. She had an attribute which amounted to a disadvantage just now, and it was this that caused Alec d’Urberville’s eyes to rivet themselves upon her. It was a luxuriance of aspect, a fullness of growth, which made her appear more of a woman than she really was. She had inherited the feature from her mother without the quality it denoted. It had troubled her mind occasionally, till her companions had said that it was a fault which time would cure. She soon had finished her lunch. “Now I am going home, sir,” she said, rising. “And what do they call you?” he asked as he accompanied her along the drive till they were out of sight of the house. “I wish for no better, sir,” said she with something of dignity. For a moment- only for a moment- when they were in the turning of the drive, between the tall rhododendrons and conifers, before the lodge became visible, he inclined his face towards her as if- but, no: he thought better of it and let her go. Thus the thing began. Had she perceived this meeting’s import, she might have asked why she was doomed to be seen and coveted that day by the wrong man and not by some other man, the right and desired one in all respects- as nearly as humanity can supply the right and desired; yet to him who amongst her acquaintance might have approximated to this kind, she was but a transient impression, half forgotten. In the ill-judged execution of the well-judged plan of things, the call seldom produces the comer, the man to love rarely coincides with the hour for loving. Nature does not often say “See!” to her poor creature at a time when seeing can lead to happy doing, or reply “Here!” to a body’s cry of “Where?” till the hide-andseek has become an irksome, outworn game. We may wonder whether at the acme and summit of the human progress these anachronisms will be corrected by a finer intuition, a closer interaction of the social machinery than that which now jolts us round and along; but such completeness is not to be prophesied or even conceived as possible. Enough that in the present case, as in millions, it was not the two halves of a perfect whole that confronted each other at the perfect moment; a missing counterpart wandered independently about the earth waiting in crass obtuseness till the late time came. Out of which maladroit delay sprang anxieties, disappointments, shocks, catastrophes, and passing strange destinies. When d’Urberville got back to the tent, he sat down astride on a chair, reflecting, with a pleased gleam in his face. Then he broke into a loud laugh. 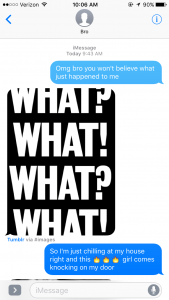 For my remediation exercise, I decided to do a texting conversation between Alec and his friend after Alec’s first encounter with Tess. 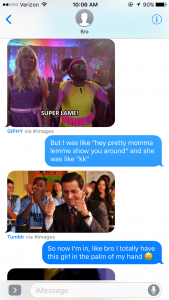 While a texting conversation was already a spin on the original medium, I added another spin and had his friend primarily respond in Gifs. I chose this scene because although it is told in the third person, we as readers really only get to see things from Tess’ side. Unfortunately I found that this was the case for most of the novel. We never really are given the opportunity to get into the other characters heads. I do not like Alec D’Urberville very much (understandably), however I found myself wondering how he interprets everything that occurs between Tess and himself. I thought that this scene was one that could definitely interpreted differently between Tess and Alec. Alec could have thought that he had really impressed Tess with his cajoling and flirtatious language. In today’s day and age, the best way to learn what a person really thinks is to read their text messages. We contain our lives on our phone, which is why so many people find themselves so protective of the little devices. Since a text is the 21st century’s most true expression of opinions, I though it would be fitting to expose Alec’s thoughts in this medium. The short texts allow each part of the scene to be illuminated in its own way. The progression of texts which build on each other also builds suspense for the reader. If we were on the receiving end of these messages, it would be thrilling to get each one, as a new part of the story was unfolding. There are many different ways to write a text. Some people break up their thoughts like I did here, while others chose to type it all out in one large message, which is almost like a little novel. 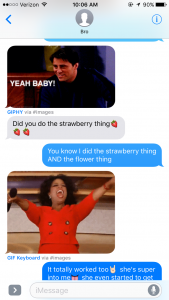 One of the unique features of the texting medium is the instantaneous response aspect. This allows the reader to see how others react to what is being said. It can also influence how the author choses to continue their story. I chose to have his friend respond in gifs for two reasons. One, with the iOS7 update on the iPhones which most of the world seems to have, more and more people seem to be using these moving pictures, as the update came complete with a gif keyboard. Now, no matter what emotion you may be feeling, there is the weird halfway point between a picture and a video to help you express yourself. 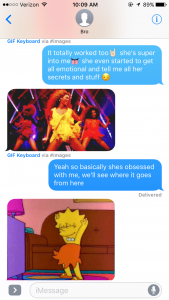 I thought that texting was a short enough method to get your point across, then came emojis, now with these gifs I wonder if people will even continue to use words at all. The second reason I chose to have his friend, or “bro”, respond in gifs is because Alec, in my opinion, is a rather irritating character, which means that he probably has some pretty annoying friends. A gif once in a while is okay but many people find that having a lot can become a bit excessive and unnecessary. An addition, responding with a gif requires even less effort than typing out a text message (which is already pretty easy). By using the texting medium, one cannot get a true appreciation of the entire scene, it is impossible for a real third person account. Things can also get misinterpreted or skipped over due to the immediate nature. 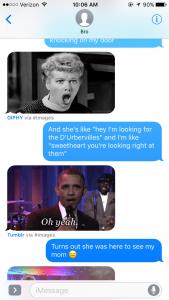 The gifs can be challenging because it could also be misunderstood. As readers we are also cheated out of a true insight into the other character’s views. This was definitely an enjoyable exercise, especially getting the chance to live inside of Alec’s head. However, this exercise did also help me to better appreciate the novel form. I much prefer richly detailed novels to moving images of Beyoncé and Oprah.